Limited Time Offer. Hurry, while supplies last. The CoreStretch is designed to stretch the back, shoulders, hips, hamstrings and shins. User can perform over 10 different stretches with this versatile product. For best results, adjust the CoreStretch to the proper length and position. To position the CoreStretch correctly, set the padded foam bar on your lap at your waist, approximately the same position as your waist or belt line. It is preferable for the number face you, number 1 on top and the number 10 on the bottom. For proper sizing, adjust the CoreStretch on one of the settings, numbered 1-10. Depress the button and lengthen the CoreStretch to the number which fully extends your arms and straightens your back but still allows for a comfortable grip with your hands. You are now ready to use the CoreStretch. 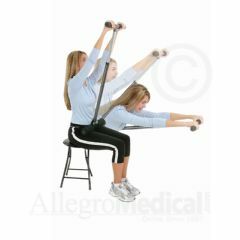 This back stretcher is very easy to set up and adjust as well as being portable. it provides a good variety of stretching exercises for both upper and lower back.